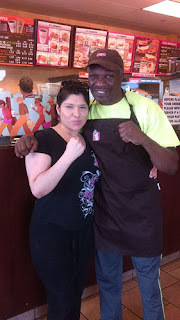 On Saturday June 6, 2015 Dunkin Las Vegas donuts shops hosted a fundraiser event for the National Childhood Cancer Foundation’s Camp Cartwheel and invited local celebrities, public figures and professionals to serve and prepare sweet treats, cashier, bus tables, greet customers and of course yell out "WE HAVE ANOTHER DONATION!" for cash contributions. We are extremely excited to announce that the event raised a total of $12,315 – we’ll be able to send 50 kids to camp!! This is a significant increase over our inaugural event last year, which brought in $7,500. The location pictured in this article was that of 6795 W Tropicana Ave on the corner of W. Tropicana Ave and Rainbow Blvd, however eighteen Las Vegas locations participated in this event. The fundraiser's volunteers included the Las Vegas Outlaws and Posse; the cast of FANTASY at Luxor Resort and Casino; the cast of Chippendales at the Rio All-Suite Hotel and Casino; Clark County School District Police; +Jay R Beatbox, local hip hop musician; the cast of SEXXY at WestGate Hotel & Casino, +JC Fernandez of Mix 94.1; +JoJo Turnbeaugh of 95.5 the Bull; Marco and John Mac of Sunny 106.5; Johiah Hall, Big D., and Claire of My 93.1; Las Vegas Fire and Rescue; +Dao Vu of KTNV Channel 13 Morning Blend; +Javelin Broderick, MotoAmerica “Supersport” Roadracer; and legendary boxing trainers Jeff Mayweather and Floyd Mayweather Sr., attorney +Eric Roy and +Rosario Grajales of RosarioKnows.com. with coverage by local media outlets and ESPN. Camp Cartwheel was established in 1996 a was created with the mission to reveal critically ill children of some of the physical and emotional stress of grueling treatments and the psychological strain of dealing with various illnesses. Some children which attend Camp Cartwheel are afflicted with such critical illnesses as cancer, HIV/AIDS, sickle cell, hemophilia, renal disorders, and immunologic diseases. The camp is open to children ages 5-17 and siblings are welcome to attend as a bonding experience. This year's Camp Cartwheel Session 1 will be held July 15-18 and session 2 will be held July 22-24 and will facilitate about 100 campers and volunteers per session. The camp is located at the Torino Ranch in the Spring Mountain Ranch about an hour outside of Las Vegas off the Blue Diamond Road exit. The 3-night camp session organizes activities such as swimming, hiking, arts and crafts, canoeing, scuba, outdoor games, rock wall climbing and much more. The deadline to volunteer was April 3, 2015 but you can still donate to the cause by visiting nvccf.org.